Heart Disease is the leading cause of death in men. According to the Centers for Disease Control, 1 in 4 male deaths are the result of heart disease. In addition, men are at risk for additional chronic illnesses including diabetes, cancer, and mental health issues. As with so many chronic illnesses, many risk factors are behavior related including an unhealthy diet, physical inactivity, obesity, too much alcohol, and tobacco use. 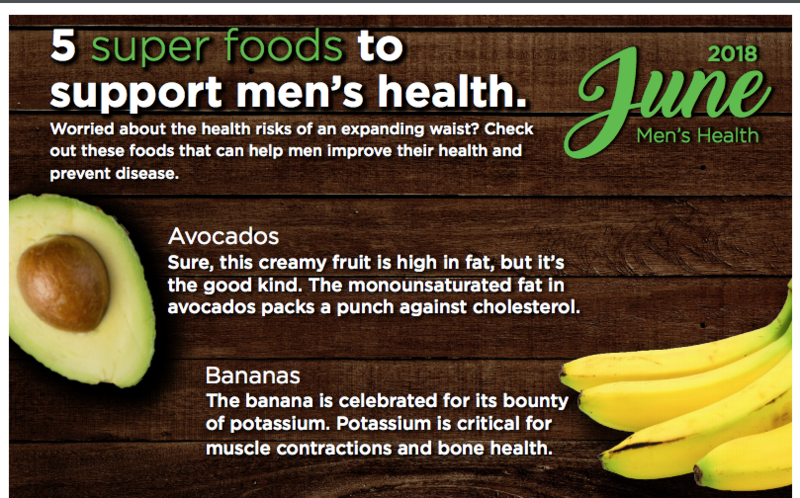 Read our June Newsletter to learn about 5 super foods to support men’s health. Offering flyers, promotional items, education and more! Don’t forget to wear Blue on June 15th. Healthy tips from the blueprint for men’s health. Check list to promote screening for Men.